Continuing with my series on how to mix neutrals. Many of us have black in our wardrobes. Even though it may not be the most flattering colour to wear as we get older we are loath to give it up, me included. I have a large collection of black trousers and a few black tops. The trick is to learn to combine it with colours that work for us. Beige and camel can also be tricky colours to wear especially if our hair has turned grey. We definitely do not want to wear all beige and disappear into the background. As beige and camel are going to be very popular colours this season lets see how we can make it work for us. Details of above: Black jacket Hush / scarf JohnLewis&partners/ V neck beige sweater JohnLewis&partners / beige DB trench JohnLewis&partners / camel tunic sweater Baukjen / patent beige loafers MarksandSpencer / Winserlondon black miracle trousers Johnlewis&partners / Beige holdall bag Hobbs / Leopard print pumpsJohnlewis&partners. These colours can look very elegant and sophisticated if carefully integrated into our wardrobes. Think accessories such as bags, scarves and shoes. Beige and camel can also look very chic combined with white later in the season. Combining textures is another way that these colours can look upmarket, not dreary. Italian women are good role models on how to wear neutrals and look elegant. Not all beiges and browns are the same. Some are cool toned and some warm. The very warm browns, rusts and camels do not suit my cool skin tone. However, I do have a 15-year-old brown Max Mara coat that is definitely a cool brown. It is a very easy to wear “dressing gown” coat. I think that I will get it out of mothballs and combine it with my blues, greys and pinks. 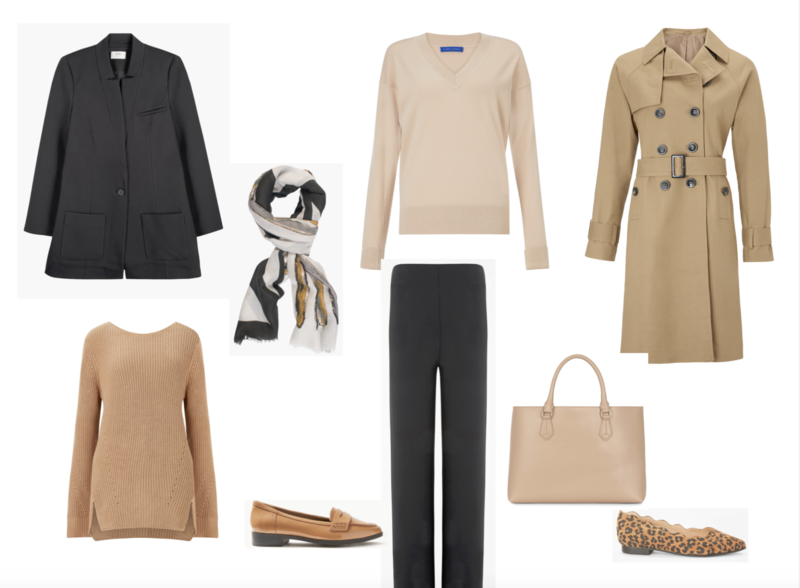 Will you be wearing beige this season or do you consider it a bit grannyish? Previous Post Tricky time of year style wise Combining neutrals. Meh. Beige. Not my color. Never has been. A good quality camel sweater can look amazing and the one that I consider to be superior to anything else I have seen is 100% alpaca by study 34 based in Newcastle. I have been looking at a camel- coloured 100% Cashmere jacket and thinking about it! But where would I wear it? I live in trousers these days and most people seem to be in trousers and Anoraks anyway. Years ago I had a cream Alpaca coat. It never seemed to pick up the dirt and was so soft and warm. I do wish I still had it! My Uniglo black (!) down jacket is soft and warm but very casual. However whenever I have worn it someone has admired it! Odd that! I used to look good in camel/beige when I had dark hair. Now it is silver & I look terrible. I love most shades of grey though & I have a chocolate brown coat which I love. Here here for the Unoglo down jacket I have one in beige it is great with most trousers and practical to take travelling as it packs into it’s own pocket size bag! Agree that beige can be both dreary and difficult to wear with grey hair. I have not yet done the switch and my coloured hair is reddish, which would do camel/toffee/caramel/cream (don’t they all sound so much better than beige?) but I have gone for silvery grey as one of my base colours; it is fantastic with cream but I have otherwise avoided the brown end of the spectrum for sometime now. Not altogether sure why, perhaps it is the association with beige?? Silly really, as some of the chicest colours when well put together are on the caramel/creamy palette. 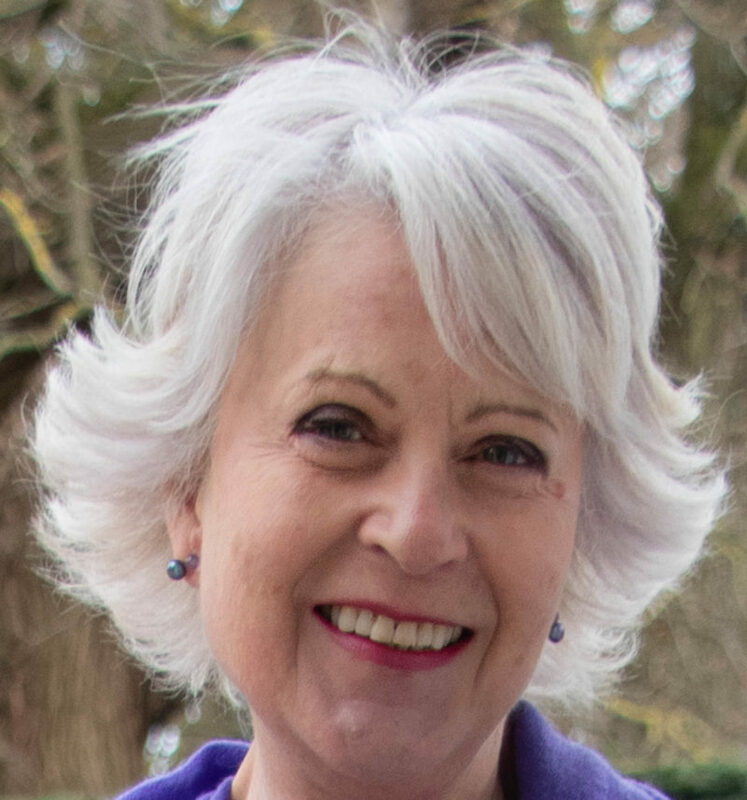 Since I now have white hair vs. the blonde I used to have, I don’t like the way I look in black unless it’s broken up with something; it just seems too “black!” I find that I’m wearing more gray which surprises me; really like it with navy. I recently purchased a pair of Vionic pointed-toed leopard flats; they have an arch support and I was able to wear them for 12 hours….lots of standing….and not a problem with my plantar fasciatis. Have another Vionic pair in the same style in silver…great shoes. I agree Vionic shoes are excellent. I have a pair of boots and a pair of trainers and they are excellent. A good blog. I love Camel, dark brown, beige, etc. Always have — goes nicely with anything leopard !! I can’t find the original post where I wrote about the benefits of silk pillows but I buy mine at JohnLewis&Partners. I have a warm undertone and the soft creams, camels and rusts have always been go to colours that brought me compliments. Now that my hair is grey and I guess skin fading a bit have to relook these colours, although rust is still good ….. and accessorize …luckily I love a nice scarf. Leopard print shoes are a must. We will be going into winter in a few months so must start watching out for good colours to brighten/warm up the cold days. Agree with Josephine .Beige is a chic color and easy to mix. I have a great camel brown shawl in alpaca who I bought in Peru 10 years ago and use in my flying trips. Also I have a marvelous camel coat from my mother but it is to heavy to use and carry in my bag. And don’t know what to do . Tks for all your advices.I don’t miss them. i am cool toned, and don’t wear a lot of black or warm colors, that’s why I like your blog, it gives me more confidence to wear my colors. Black is easy, and available, anyone can do a blog of that, it’s much harder to find a blog that embraces pink, blue, grey, cream, and is adult as well, thanks. The Vivienne Files is another great blog (though I love this one too!) and includes your colors. Anything on the brown/orange/yellow spectrum is a big no for me, even red that has an orangey tint drains me. I love the shades on other people but have learned to avoid them. I have a beige trench and a creamy leather jacket but make sure I have a colourful scarf near my face when I wear them. As my hair is very silvery now I find I am favouring navy more than black but will always have an LBD in my wardrobe just in case! Similarly 2 pairs of black trousers for times when only black will do. Thanks everyone for sharing the difficulties when your coloring changes! I am transitioning and can’t for the life of me figure out what color I can wear now in which I would want to be seen. I am not a full on fushia person, but sure can wear it! Yes, scarves are my friends now. I think I need to “have my colors done”. Thank you for this blog! I remember when I had my colors done a very long time ago, that the prevailing opinion was that as one aged, you’d want to move away from any colors that drained your skin. The idea was that high contrasts, created by the shadows of anything too dark (including hair color or eyebrows) are to be avoided. I noticed when I was becoming paler that any too-dark hair color forced shadows underneath my eyes, which was draining enough, let alone adding black or even dark navy to the mix. There was a somewhat painful length of time when my body changed, not once, but twice, expanding then contracting (thanks hormones) but I still liked black, but could not wear it without regretting it. Eventually I got past all that sturm und drang and now I’m fine with where I am. I still cannot make myself wear the darker pinks I was given when they did my colors originally; there’s a mental hurdle about some colors. But when one wants to look good, you’ve got to just accept that you cannot wear the colors you used to be able to wear. For me that represented a few years’ worth of struggle, and body changes meant throwing out mostly everything and starting over almost completely. I’ve got very white skin so it was always possible to look good wearing black, but being honest, unless it is a very blue-black, I’ve given up trying to scrape on enough makeup to make it worthwhile. The answer near one’s face is one’s makeup shades and either cream (for most skins) or white (for true Winters). Beige is usually a warm-undertone ‘light’ shade and cannot be worn by everyone, but the ‘beige’ range (from cream to tan, let’s say) is a good underlying skin color for just about anybody, it seems to me, as long as you get the right tone and shade for *your* skin. Thank you for joining the conversation. You are correct as we get older our colouring does tend to fade and it is best to go with the flow and embrace this change. The colours that we wear often needs some adjustment. Strangely I now seem to be able to wear brighter colours than before although still cool. In order to maximise my wardrobe, I continue to wear some of my darker tones such as blacks however I make sure that I add a bright scarf or jewellery to flatter the face. I intend to experiment with some of the greens this Spring and might even try a few beiges, although they have never been my best colours.